The antennas of a roach are important sensory organs. These antennas have small hairs on them that allow the cockroaches to sense the world around them and survive. The antennas help the roach detect heat, moisture, temperature, chemical consistency, etc. Cockroaches are the easiest spotted pests in any part of the country and while most people scurry away from these little critters, there are few who are very interested in what makes them tick. Cockroaches are known as survivors and it believed that they can survive even nuclear blasts. So, they have somewhat become a phenomenon in the scientific field. The two inch critters have a long thick hair like object that protrudes from their head and is often seen bobbing side to side or up and down. These things are actually known as antennae and it is a multifunctional sensory appendage that is essential to the little roach’s survival. 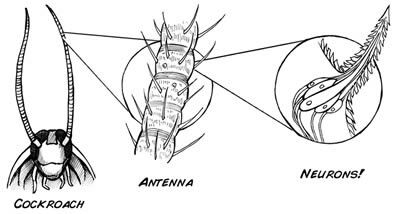 A typical cockroach antenna has three parts: scape, pedicle and the tip is known as flagellum. Each segment is connected to the neighboring segments via flexible joints. The flagellum is the longest portion that makes up the antenna and has small hair that is visible over the surface of the flagellum. These hairs are scientifically known as sensillae. The hairs on the flagellum is responsible for working as sensors, enabling the cockroach to understand its surroundings. In addition to helping it avoid large objects, the sensillae can also sense things such as smells, chemicals, mechanical pressure, humidity, and temperature. The scape and pedicel also have mechanosensorysensillae used for sensing the position, movement, and state of the flagellum. The movement of the antenna determine where the cockroach is going to travel next. Even when the flagellum touches a certain object, it can access the object’s chemical consistency, its temperature, and other such information. The scape and pedicel also play a part in helping determining the object’s solidity and direction. Each sensilla is connected to the nervous system and goes to its own center in the brain, although some generalities can be identified: neurons from temperature, humidity, and smell sensillae go to the antennal lobe, while mechano-and chemosensory sensillae go further to the deutocerebrum and suboesophagal ganglion. An important aspect for the cockroach is to keep the antennae clean and that is why they keep pulling the antennas towards their mouth and pass them through their mandibles. This grooming, keeps the hairs on the antennae clean and less prone to making mistakes when sensing objects.